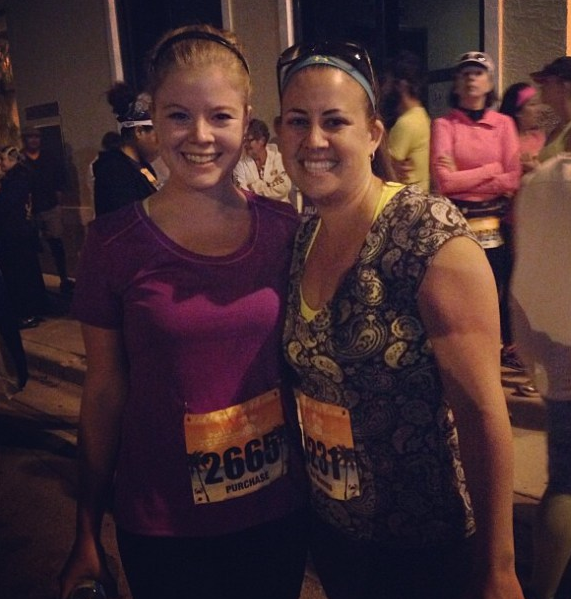 I still can’t believe I ran a half marathon only 2 days ago! I wrote about my day-before race prep here, now onto the main event! My alarm went off at 3:30a, and since excitement kept me from a good night’s sleep I was out of bed, downstairs, and ready to go within 20 minutes. Erin came over by 4:15a and we were off! We parked near the starting line, then waited in line for 40 minutes to pay for a parking meter. We didn’t check any bags, just locked everything in the car. After we paid we made a mad dash to the line for the porta-potties, then took our place at the start near the 2:45 pacing sign. I didn’t actually hear the race start (no gunshot or countdown), but at some point everyone started moving forward en masse. Because there were so many people, everyone started out waking until they actually crossed the starting line, then picked up the pace. It was really great running so early in the morning, especially on downtown streets blocked off from traffic. Our first leg took us to A1A, and we reached it right as the sun started to rise. Beautiful. We ran a while along A1A, then turned into Birch State Park. We decided to use the porta-potties there since there were more than we’d seen, and my nerves were making me have to go! Unfortunately, it cost us about 10 minutes and we lost our 2:45 pacing group. But we kept on. We headed back out to A1A north until mile 8, then turned and headed 5 miles back to the finish. We both started feeling the burn right at about 11 miles, but with strangers cheering and encouraging us on (and a fellow runner who told us the 11-mile warmup was over and it was time to start the 2-mile run – ha ha), we pulled through. We finished our water bottles, chucked them to the side, and sped up, passing people we’d been stuck behind for miles. 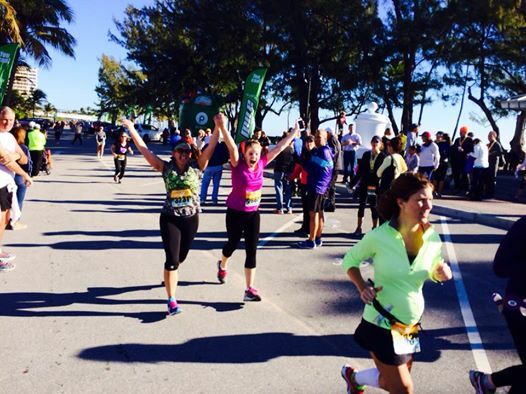 As we neared the finish line we kept telling each other to keep moving and that walking was no longer an option. I was getting more and more emotional as we got closer and could see the last mile… then someone said we had half a mile… then a quarter mile… and then I saw my family and lost it. Seriously, I cry waaaaaaay too much at these things. 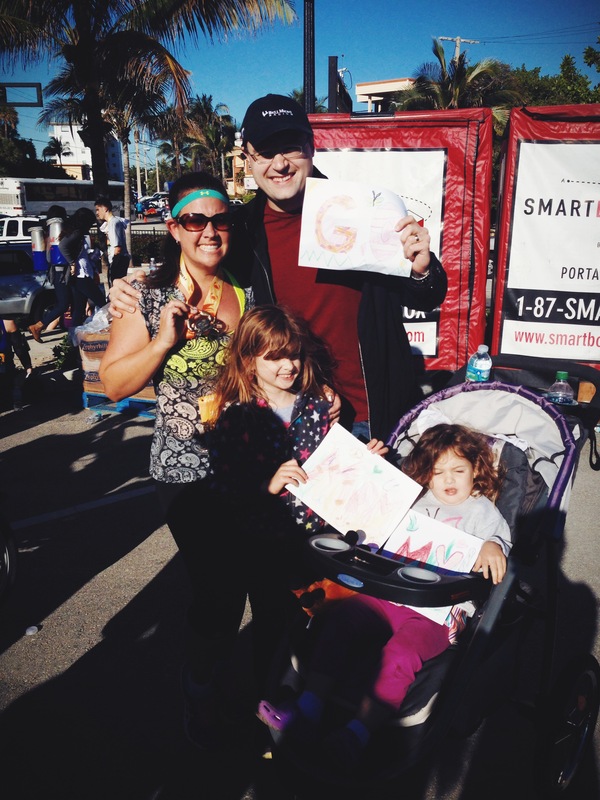 I was so touched that Jay and the girls had come to watch me cross the finish line. They had made signs that said, “Go Mommy!” and were holding them up for me. For me! Emily was jumping up and down. 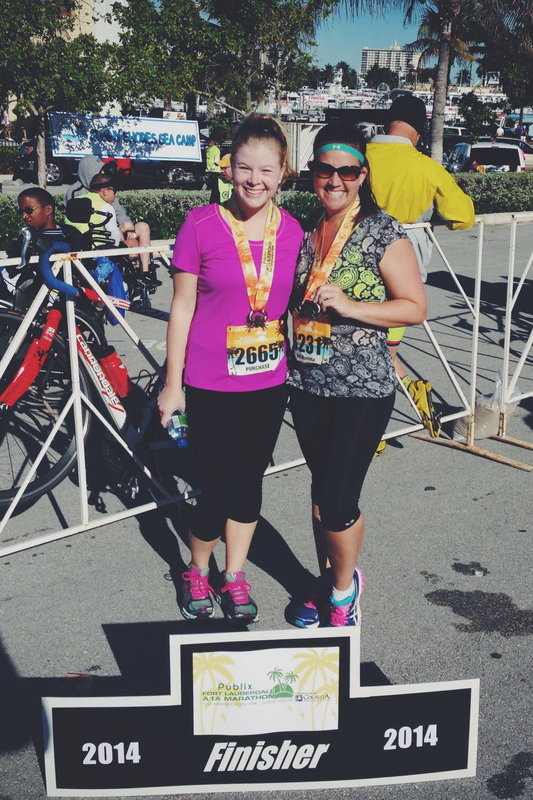 And Erin and I crossed the finish line together – just as we’d hoped. Our official finishing time was 2:46:16, which was pretty great considering we’d had to make that bathroom stop in the middle. I couldn’t believe we did it, and I’m so thankful that she invited me to join her! 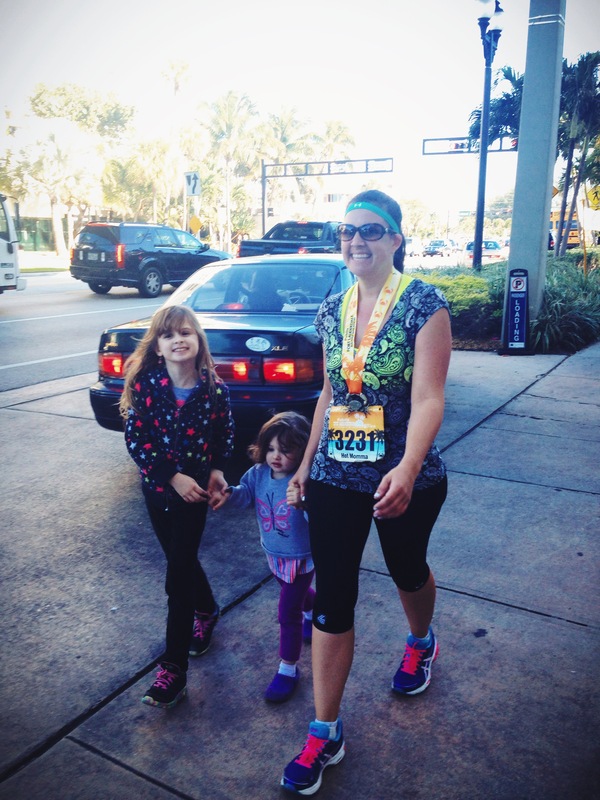 This marathon run always has beach-themed medals, and the medal for 2014 was a Stone Crab. Not the prettiest thing, but Emily loves it and wants to take it to school for show-and-tell. 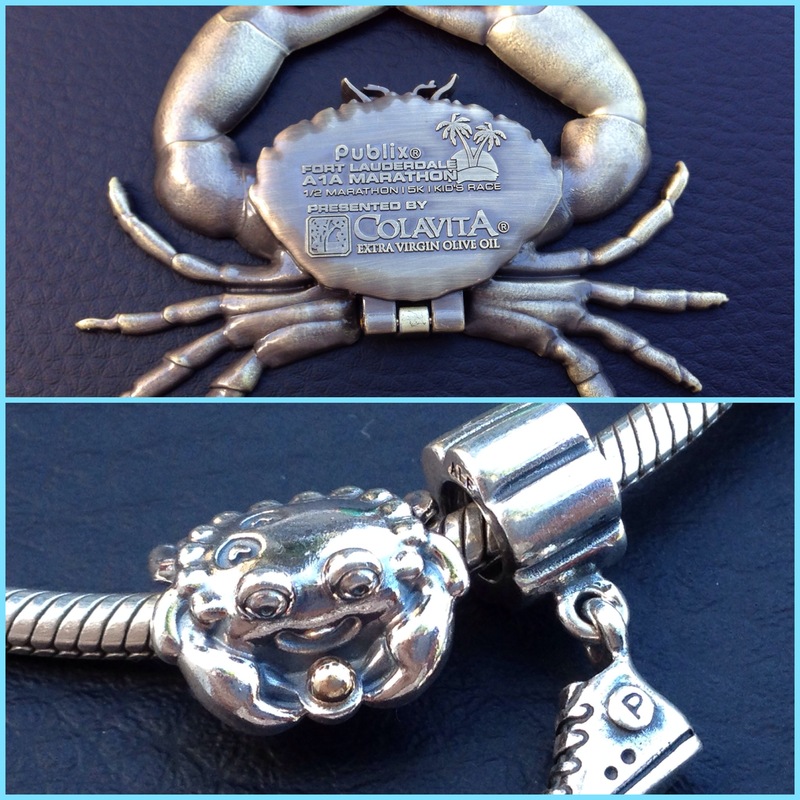 While I’m proud of myself and love the medal, I don’t plan on wearing it or hanging it on my wall, so instead I used some leftover Christmas money I had saved and bought a cute little crab charm to represent my achievement. 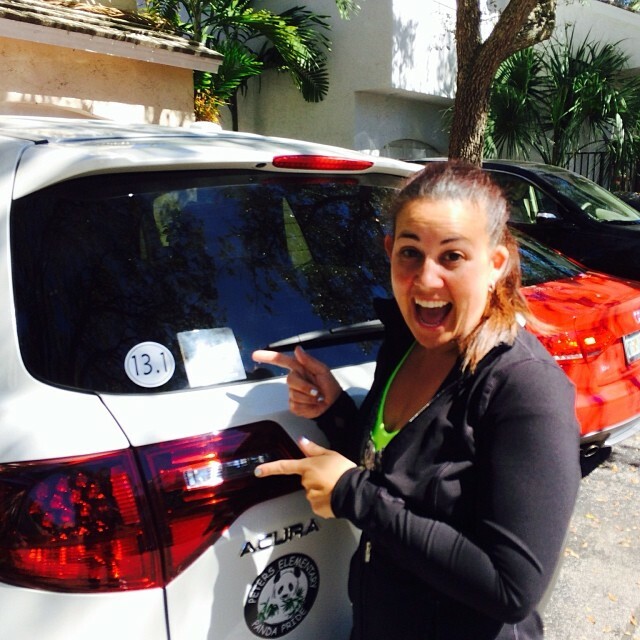 And, of course, I could finally put that coveted 13.1 sticker on the back of my car. Yippee! At one point during the run Erin asked me what my favorite thing about the half had been. I enjoyed running and training with her, and knowing I was accomplishing my goal was pretty great, but hands down my favorite thing was the expression on Emily’s face as I crossed the finish line. The way she kept jumping up and down and saying that she had the most wonderful mommy in the world because I can run 13 miles. How she kept holding my hand and looking up at me. It’s the most amazing feeling in the world to know that your daughter is proud of you. I still tear up thinking about the smile on her face as she watched me run past her, and that’s the single thing that made all the effort worth it. And I’m totally letting her take my medal to school for show-and-tell. Aw, what a sweet memory. Congrats on running your first half marathon. May many happy miles be waiting for you. Aww, this made me tear up! I’m so happy for you and so, so proud of you!!!! Oh my gosh, I am teary eyed right now!! LOVE THIS!! What a sweet post- you’re so energetic and positive and so incredibly beautiful! Wow!! You are such an awesome mom!! Your race sounded like such a great experience and I love the picture of you putting the sticker on your car! What a great accomplishment! You should be so proud! I love the signs made for you and the medal!! So cool!! Great job, really, you’re an inspiration! Aw, thank you so much! That’s so nice! I really appreciate it!